Fairfax County has awarded RRMM Lukmire Architects the Department of Public Works and Environmental Services Award of Excellence for Building Design and Construction on the Fairfax Connector Huntington Bus Operations Facility Project. 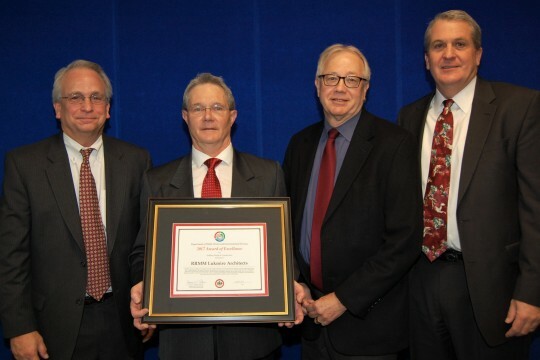 The project team accepted the award at a ceremony held December 15 at the Fairfax County Government Center. This 6,000-SF project includes renovations and new construction for the Fairfax Connector Huntington Operating Facility. It provided two new maintenance bays—one drive-through and one pull-in bay, as well as new services, lifts, and MEP infrastructure. The project also provided approximately 3,000 SF of new storage space and renovated locker room facilities for bus maintenance personnel. In addition, all parking lots for buses and personnel vehicles were redesigned to create a more efficient layout. RRMM Lukmire is the new entity created in 2016 by the merger of RRMM Architects and The Lukmire Partnership, which had both been in business for over 28 years. Staff from The Lukmire Partnership continue to serve clients in the Mid-Atlantic region but with increased support and experience from other offices when needed. For more information, please visit www.rrmm.com.